It was 2:30 a.m. July 8, 2010 and I rolled out of bed. I knew my wife hadn’t come to bed or slept as she seldom does the night before a trip. I called out to her and I couldn’t hear myself talk. She offered to cancel her trip but I insisted she go as her recently widowed mother needed my wife’s presence more than I. I drove her to the airport. Later that morning I picked up the receiver of the wall phone in our kitchen to call for an appointment with my personal physician. Deaf Lesson # 1. Normal telephones don’t work for the deaf. Thus began my indoctrination into my new world. It had been nearly a decade since my right ear had lost most of its function. Due to the type of residual hearing I have in that ear, the ENT didn’t recommend a hearing aid. Now my left ear….my “good” ear had died while I was asleep. Futile attempts to remedy the situation with my left ear were made first with a regimen of antibiotics and then with a direct injection of steroids into the middle-ear. The ENT then suggested the best hope I had to reclaim some hearing was a cochlear implant. At this point with a little cautious hope, I began my research into cochlear implants. For reasons of my personal safety and for the safety and convenience of my customers, I couldn’t continue to work being deaf. My employer, a well recognized large corporation and my immediate manager were extremely supportive. I was fully qualified and retired even though it was earlier than I had planned.. The more important immediate decision at hand was where to pursue my implant surgery. After some consideration and discussion, due to the number of follow-up visits after surgery, I chose the closest clinic 110 miles away as recommended by my local ENT. Emotions brought on by the hardships caused by becoming deaf began to rise within me. The telephone calls to our 2 surviving parents, to our adult children, young and adult grandchildren, our great-grandchildren became lessons in futility, aggravation and at best, a mental struggle. I watched as my wife took on the burdens of dealing with our retirement arrangements and insurance companies. Since my early teenage years, music had played a large part in my life. Whether singing in choirs, singing roles in operettas or playing guitar and singing in a band or just listening to music in my personal collection, music had been my escape from daily stresses even as an adult. Suddenly I lost that outlet. My education into the world of being deaf was a lesson of continuing frustration. Beyond that, I couldn’t remember ever feeling so lonely or so isolated. Finally I got through the convoluted qualification process. Even though my left ear had died, the surgeon elected to implant it as the nerve in that ear had most recently been normally stimulated. The surgeon also prescribed the most powerful hearing aid for my right ear with hopes that it might give me some minimal albeit distorted hearing while I waited for implant surgery. It did and still does. With the hearing aid quite often I still had to resort to using a whiteboard or paper and pencil to communicate. 15 months after becoming deaf, my wait ended and my left ear was implanted. The surgery went well and I endured the 110 mile drive home with my wife that afternoon. Except for one severe vertigo attack and a gradually improving equilibrium problem, my recovery from surgery was uneventful. Reading about the experiences of other implant recipients had prepared me for my activation. Would I hear whistles, Minnie Mouse, Donald Duck or Darth Vader? Would I hear anything at all? During this whole arduous process I constantly prepared myself to accept the worst possible outcome. While I realized that the vast majority of implant recipients attain great results, I didn’t want to allow myself to become overly optimistic. In the event of a failure, I didn’t want to fall too far. The day of my activation finally arrived. Sitting in a chair near my implant audiologist, she attached a cable to the sound processor, put it on my left ear and placed the coil/antenna to the corresponding area on my scalp. Informing me that the impedances looked good, she stated she was going to turn it on at a very low volume so it would not startle me. She asked me to turn off the hearing aid on my right ear. There was a quiet click and she asked “What do you hear?” I responded “I hear you talking.” My wife interrupted “Can he hear us?” I replied “Yes dear, I can hear you.” At that point the audiologist left the room to get a box of tissues. It was an emotional event as I was one of those extremely lucky few recipients who hear human voices at activation. The next morning I came out of the bedroom after fitting my new hardware and my wife whispered to me in an effort to keep from waking our visiting 5 year old great-granddaughter. I responded appropriately. She got tears in her eyes and grinned as she informed me she was whispering. The stories I tell of my family reveal that which I treasure most…my family. 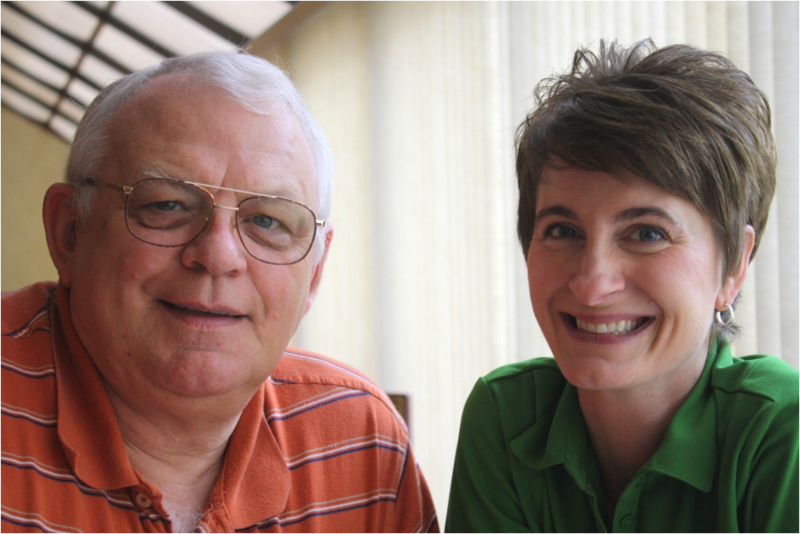 The stories earned me a nickname among some cochlear implant recipients at a user website. Spelled phonetically I’m called “Paw-Paw CI-borg”. 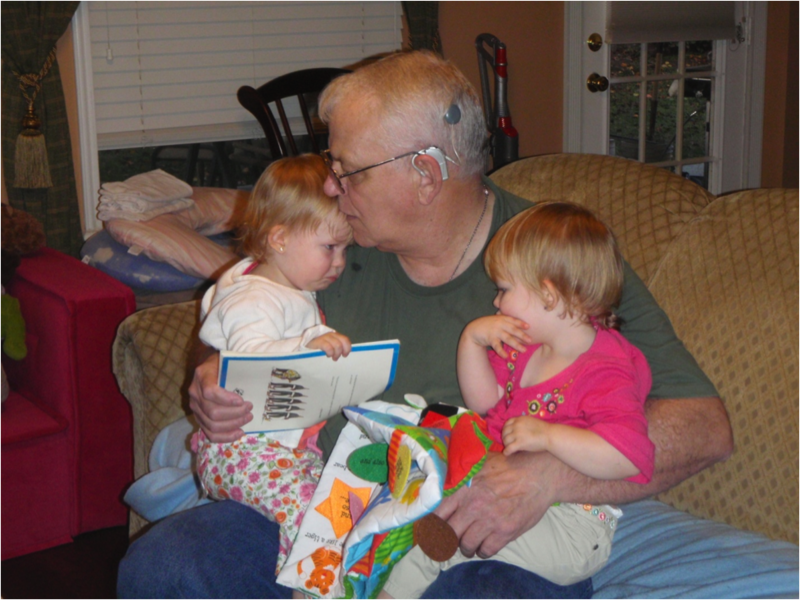 Pictured here with our twin 22 month old granddaughters at Christmas 2011 just 4 weeks after the activation of my cochlear implant, I was reading to them. And yes…..happily..I could hear them calling for “Paw-Paw”. Now 4 months post-activation the ability to again be able to hold a conversation with most people amazes me! Daily I listen to music some of which some seems fairly accurate. Listening to television audio still requires a little concentration but is improving. A few weeks ago, my wife and I went to the movies and with the exception of one gravely –voiced male actor, I was able to follow everything easily. I am confident things will continue to improve as I gain more experience with my implant. Nearly 21 months after becoming deaf, I am still amazed by the capabilities of the human mind. I never consciously made an effort to learn to read lips but the ability seemed to arrive one day. What an incredible experience it was on another day some weeks after activation, when my cochlear implant overtook my hearing aid as the dominant provider of both the quality and quantity of what I hear! I live in a remote, sparsely populated area in the Pacific Northwest. This past week while traveling in eastern Tennessee, I had the pleasure of meeting my second cochlear implant recipient, a new friend. In a hotel restaurant we ate breakfast while sharing hearing and family stories. I am certain we raised a few eyebrows with our whooping and high 5s. She and I were overjoyed to be able to have an intelligent conversation. We celebrated the restoration of a part of our lives we lost when we became deaf and we credited it to the miracle of a cochlear implant. Ken meets our own Jennifer Thorpe! And now my wife is encouraging me to go bilateral.